On my most recent vacation to Edisto Beach, I noticed a lot of people fishing on Carolina Skiffs in the marsh and out on the ocean. I was doing some fishing myself on the beach, so it looked like a lot of fun. So I thought I would do some research and find out what makes these boats so popular. Here is what I found out. Carolina Skiffs are made out of 100% composite materials. 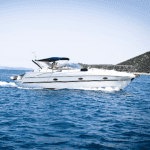 They utilize a box beam construction which creates a solid, durable, and non-flexing hull. Carolina Skiffs come in several models to meet everyone’s needs including the Ultra Elite, DLV, DLX, JVX, JV, and the J Series. They range from 12 to 27 feet long. No matter which model you choose, all Carolina Skiff boats are certified by the National Marine Manufacturers Association and exceed Coast Guard requirements for flotation. Generally they require little to no outboard engine trim and will even be able to self bail under a balanced weight distribution. You can find out more about the particular models here. The Carolina Skiff has many advantages, in addition to needing little to no engine trim and being able to self bail, they are affordable. Their construction method makes them durable and stable. Carolina Skiffs are also pretty fuel efficient. 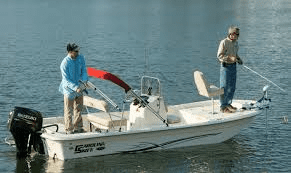 They are a versatile little boat and are great for fishermen or anyone who just likes to do a bit of boating. I did find that due to having a flat bottom, the ride can be rough in any larger chop, but works good in light chop and perfect in calm waters. Overall I think it would be a great boat for doing some coastal fishing around Edisto! If you own a Carolina Skiff, we have boat covers and bimini tops to fit your boat.